Free full 2018 Calendar Template with US Holidays. 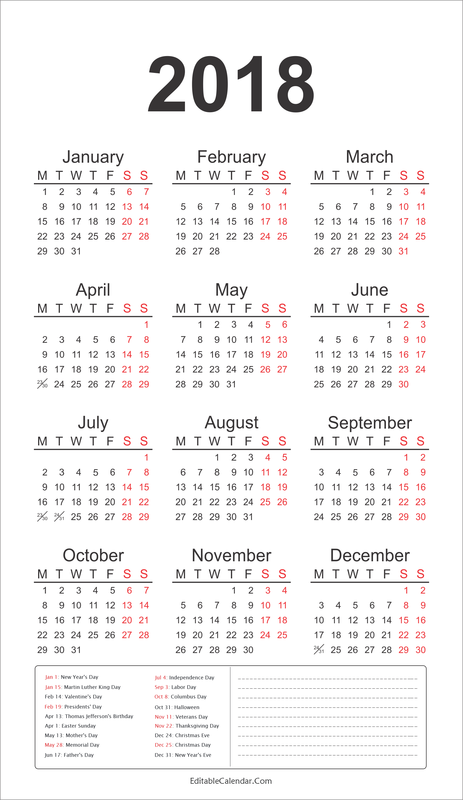 This calendar have full 12 months in one page and include all 2018 US federal holidays. It also have space for notes too. Jan 1 – New Year’s Day. Jan 15 – Martin Luther King Day. Feb 19 – Presidents’ Day. Apr 1 – Easter Sunday. Apr 13 – Thomas Jefferson’s Birthday. May 28 – Memorial Day. Jun 17 – Father’s Day. Jul 4 – Independence Day. Sep 3 – Labor Day. Oct 8 – Columbus Day. Dec 24 – Christmas Eve. 2018 federal holidays and observances, 2018 federal holiday calendar, 2018 federal holidays word.